A good week of learning ended on a high with the whole of Year 6 taking a closer look at the country of Brazil. Having identified similarities and differences between Southsea and Waterlooville (there are quite a few! ), children moved on to do the same with Waterlooville and Rocinha (in Brazil). We also located Brazil within the world, creating ‘clue’maps to identify where the country sits. This will help develop the children’s prior knowledge of Brazil which is one of our topics for the Summer Term. 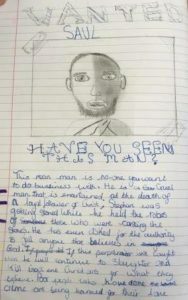 We are now well into writing monologues and letters from the viewpoint of Ernest Shackleton; we have been impressed with the children’s ability to empathise with his situation and communicate a certain ‘feeling’ towards the reader. We are looking forward to taking part in ‘Stations of the Cross’ which will be held in the chapel at Oaklands next Wednesday afternoon. What another busy week! The children of year 6 have been exploring and applying their knowledge of area and perimeter within a real-life context in the form of our new Unity Building here at St Peter’s. Within this, some of the children have also been embedding their knowledge of ratio and scale when they were asked to compare the Unity Building with that of an ‘imaginary’ building at Oaklands. In English, children have deepened and widened their understanding of one of Britain’s great explorers, Sir Ernest Shackleton. We think they are beginning to enjoy the unit more, now that they have a greater understanding – through the use of a DVD – of his Endurance Expedition and the challenges that they faced as a crew. Their understanding and enjoyment should only increase as we have his ‘South’ diary (in the shape of a book) to explore and read. This will really develop their language and vocabulary choices that they have at their fingertips! Full steam ahead! The children competed in a round-robin hockey competition this week, where they were able to apply their skills in to a game situation. They worked on ‘holding their shape’ as a team, so they would not ‘bunch’ as a group, which meant that players were able to pass around the pitch more easily and they were able to use the full width and depth. This will hold them in good stead for our later invasion games that we will undertake during the summer term. We hope they are looking forward to starting tennis next week with the Year 6 teachers – Mr Land and Mr McEnroe! This week we have spent much of our math’s time learning how to read and interpret data presented in line graphs. The children showed real creativity in conjuring up stories to match the journey of lines across a range of graphs, and this experience helped them when faced with the real thing. We finished up with conversion graphs which challenged the pupils to identify equivalent values for pounds, dollars, euros and even Polish zloty! We must congratulate Alicia Lea, Ernie Purkis and Freya Bijumon who were worthy representatives for Year 6 in today’s ‘Off-By=Heart’ Poetry Competition. Having been selected from a pool of 64, each child put tremendous efforts in to bring their chosen poem to life, entertaining the entire school and visitors with their renditions. In fact, the whole show was a rousing success, illustrating that it is possible to master something when we put our minds to it. Thank you to those parents who attended this week’s parent’s evenings; we value the opportunity to meet face-to-face, sharing successes and next steps. If you didn’t manage to make an appointment, you may still contact the school and arrange to meet teachers at a mutually convenient time. Don’t forget – check out Mr Land’s, Mr Pratley’s and Mrs Moore’s bedtime stories in the KS2 section of the blogs! What a wonderful week of weather we have enjoyed, welcoming the pupils back to school after a well-deserved week off. We hope you enjoyed a restful break – the pupils certainly seem ready to get back on with their learning! In English, we have been looking at how writers use dialogue in their stories to move the action on. Children played around with this technique using some scenes from Stormbreaker; we aim to write an additional chapter in the next few days. Our maths lessons have focused on using and applying understanding of co-ordinates relating to the position of shapes on axis. We are now much more confident in translating shapes, completing shapes with missing sides and identifying missing co-ordinates on blank grids. If you would like to find out more information about the teachings of the ten gurus in Sihkism, please ask a Year 6 child. Having researched facts surrounding this interesting religion, pupils were given a choice of form to present their information: non-chronological report, leaflet or poster. The resultant pieces have been well though out and creatively produced; it is going to be a challenge to pick some for the KS2 Spirituality Book. Many thanks for your continued support and we look forward to meeting with parents and carers at the upcoming parents’ evenings. Selling our gadgets in the ‘Teacher Den’! The end of the week and half-term culminated with a ‘Dragon’s Den’ style pitch to the Head Dragons, Mr Cunningham and Mrs Knight. This was in our English unit, where the children had written speeches to convince them to purchase their ‘must-have spy gadget’. Being enthused by their product meant that the speeches came across with purpose, persuasion and vigour, making the judging extremely difficult. This week, the children also presented their poems ‘off-by-heart’ to their peers, impressing themselves and each other with their memorisation skills. It was just unfortunate that only three could be chosen from across the year group as there was a whole host of talent on display – the adults were bowled over. Enjoy a well-earned restful break this half-term. We would encourage children to have the odd bit of time spent working through homework set and Satsbootcamp online. STEM Day – filling the vacuum! Another busy week in Year 6 culminated on Friday with our second STEM Day of the year! The children designed and constructed their very own personalised vacuum cleaner – they were that good, that a lot of the groups ended up being able to hoover the mess they had created! There is officially now no excuse why your child/children cannot keep their bedroom floors tidy! It was fair to say that some of the children, in the morning, found the prospect of this task a challenge but they honestly really showed their inner steel and resilience. All adults were genuinely proud at their perseverance. In other news, the children have really developed their collaboration skills – one of our 6C’s – in their PE time where they have combined and applied their hockey skills to partake in small-sided matches. It has been good to witness their independence and maturity with the demands that this sport brings. Hopefully, some of the girls can aspire to reach the gold standard of our current Olympic champions! Please keep the SATS Bootcamp revision sessions going as part of your child’s home learning. We very much appreciate it. What a Friday! What a week! The children, like the teachers, showed their resilience today with getting down to task, even though the snow didn’t deliver! To test their persuasive powers, the teachers tasked them to write a letter to Mr Cunningham, demanding that the school be closed at midday, due to ‘forecasted’ heavy snow for the afternoon. It was great fun hearing all their arguments and reasons, tenuous or not, as to why or why not the school should be closed – this built on their persuasive letter to MI6 earlier in the week. Thank you to all parents and carers who attended the Year 5 and 6 Mass on Tuesday. Well done to all children who practised their oratory skills to a large audience – they read clearly and concisely. As we enter the final third of the half-term, please continue to support your child as you have been with their home learning activities, as we have already noticed a difference in their reasoning and application. Hopefully the SATSBootcamp website has been beneficial to both parents and children. For science we are commencing our unit on evolution and inheritance. To kick this off, we request that your child bring in a photo or photos to compare likenesses between them and close family members. Alex Rider wanabees and decimal converts! Having spent this week deepening their knowledge of decimals and fractions, Year 6 children should be able to explain that we are now 1/3 or 0.333 through our six week term! In addition to our daily arithmetic, we have applied our understanding of place value to solving problems involving decimals, explaining our reasoning. 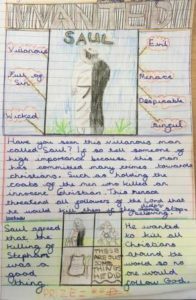 Our English lessons have focused on crafting persuasive paragraphs that communicate the skills and strengths children have that make them suited to the position of an intelligence officer in MI6. During the week we read a current advert for such a position which helped identify the skills and attributes required and the specific vocabulary to be used. To develop our use of repetition for effect, we watched and evaluated excerpts from speeches made by Donald Trump – someone who adopts this technique for their own benefit. In R.E. we continued to focus on Saul and considered the impact Jesus’ revelation had on him as he was journeying to Damascus. Next week we are going to learn about a well-known celebrity and their revelation moment. Who could it be? Thank you to all parents and carers for your continued support with home learning, particularly with reading and maths. 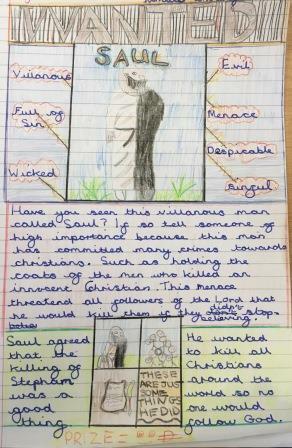 It is good to see that children are making use of the CGP books purchased last term. We have a SATS parent meeting this Tuesday, 22 nd January at 5:30pm. We look forward to seeing you then. We hope that you all had a fun and restful Christmas break. Year 6 have come back to school in fine fettle and have already shown a high level of commitment to their learning this week – this has been exciting to witness! The children have started a writing unit analysing and unpicking Anthony Horowitz’s Stormbreaker novel, and they have been thinking creatively about the attributes they possess to also become a spy, like the main character, Alex. In R.E. the children have commenced their ‘Revelation’ unit where they have explored the role of Saul in the Bible and his remarkable, unlikely Conversion. 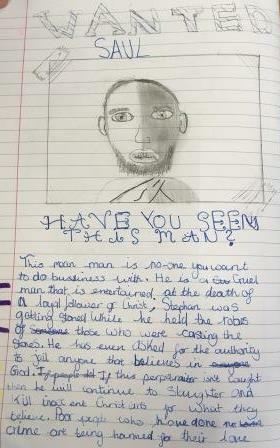 Attached are a couple of examples of a ‘Wanted’ poster for Saul – the children really enjoyed completing the posters. On top of this, the Poetry Competition 2019 has been unveiled to the children, and they should all have a copy of the booklet at home to practise their chosen poem. We strongly recommend this process as it not only promotes a love and enjoyment of poetry, but it also instils the element of perseverance and resilience – qualities that will serve them well in other facets of their life. Therefore, please endeavour to help your child/children learn their chosen poem. They have five weeks to learn it! Well that week flew by and Christmas is fast approaching; hopefully you are all feeling well prepared. Between singing practises for the Carol Services in school and at Sacred Heart Church, the children did manage to continue their learning. In English, to tie-in with our Wolfbrother topic, we learnt about how to prevent bears from entering your property. Children have been allowed to choose their viewpoint for writing from: TV reporter, Park Ranger, Neighbourhood Watch Leader or Bear Protection Organisation. We spent time thinking about how each organisation may present their writing differently and are looking forward to seeing a good range of outcomes next week. In maths we have been revising and deepening our understanding of geometry – particularly angles in shapes. It has been nice to move away from the four operations after a long term! In RE we have continued to explore Advent with a focus on why Christians believe in the second coming of Christ and how this means we must always be ready. With that in mind we’ll bring this short blog to a close and allow you to continue with your own preparations!